24 wooden beads with at least a 6mm hole. 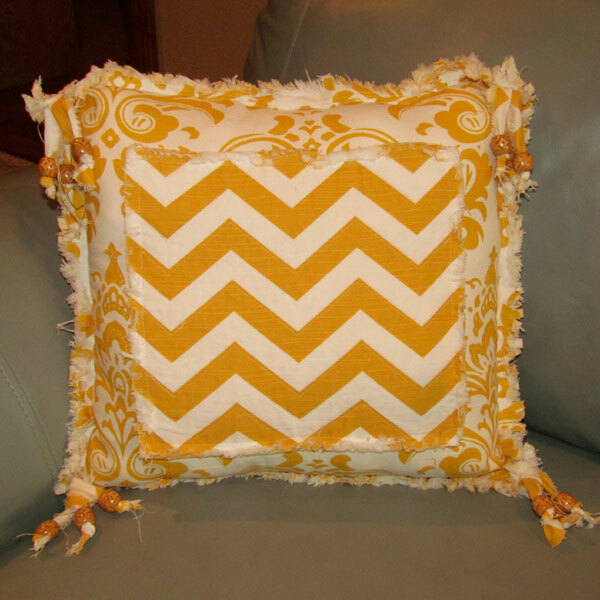 *I’ve also included some instructions for adapting this pillow design to homespun fabric instead of the cotton canvas fabric. 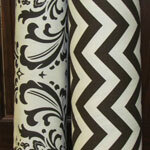 It makes a great looking pillow in homespun also! See adaptation instructions. *Unless otherwise specified, all seams will be 5/8″ width and all pieces will be stitched with the WRONG sides together. Prewash fabrics and press flat until they are smooth and wrinkle free. From Fabric 1 cut two panels measuring approx 17″ x 17″. Clip the raw edges on all side with clips that are 1/2″ deep and 1/4″ apart. 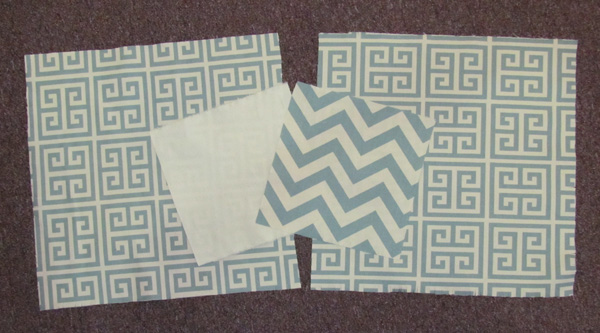 From Fabric 1 and Fabric 2 cut one panel of each measuring approximately 9″ x 9″. Clip the raw edges on all side with clips that are 1/2″ deep and 1/4″ apart. From Fabric 2 cut two panels measuring approx 17″ x 17″. Clip the raw edges on all side with clips that are 1/2″ deep and 1/4″ apart. 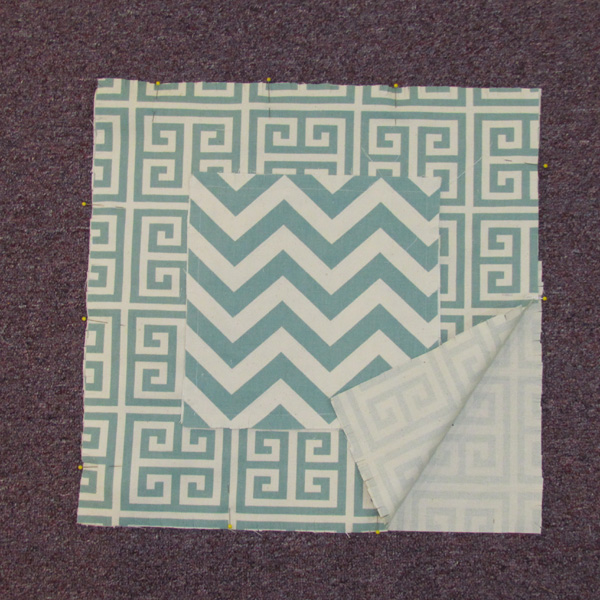 If you choose to use Fabric 3, cut two panels 9″ x 9″ from Fabric 3. Tear remnants into 1″ strips and then cut the strips into lengths of 6″. You will need twelve of these from Fabric 1 and twelve from Fabric 2. Tie a knot into the end of each of the 6″ strips. 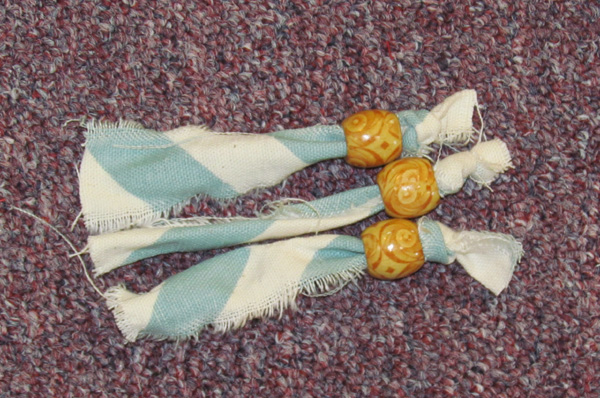 Slip a wooden bead onto the strip by folding the end of the strip several times. Push the bead all the way down to the knot. Place one 9″ square of Fabric 2 on top of a 9″ square of Fabric 3 if you have chosen to use Fabric 3. 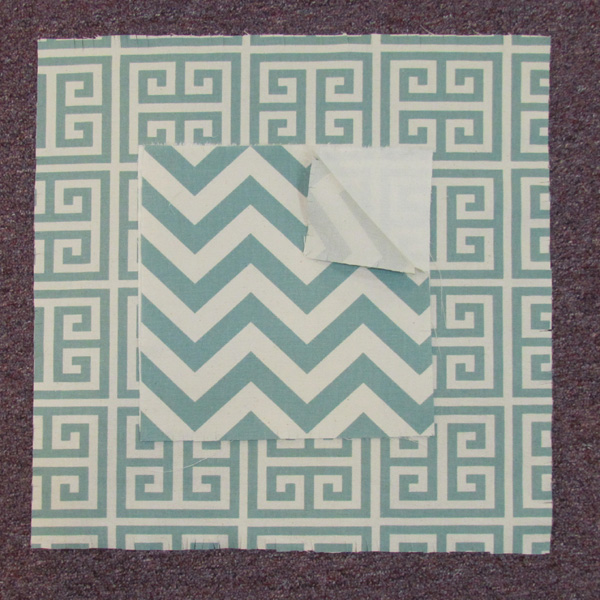 Then place the two layers onto the center of one 17″ square of Fabric 1. 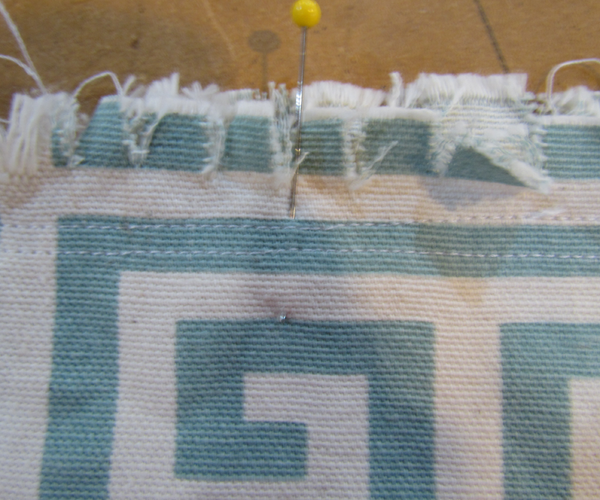 Pin through all three layers and stitch around the perimeter of the 9″ square about 5/8″ from the raw edge. This is the front panel of the pillow. You may do some “detail” stitching inside the inner square at this point if you wish. 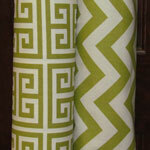 We often like to stitch along some of the natural fabric design lines for a “quilted” type look. 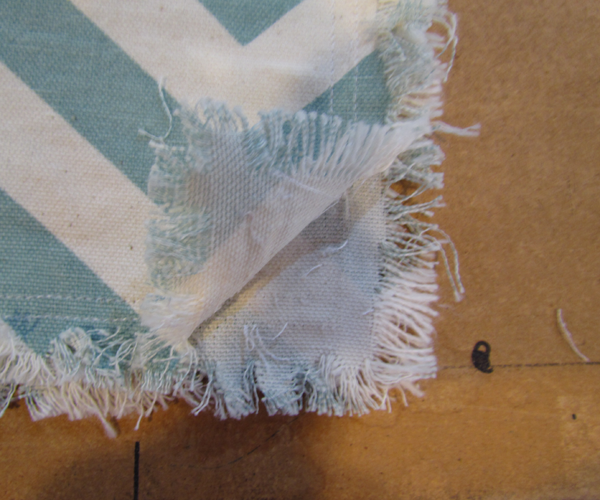 Now place this front panel on top of the remaining 17″ square of Fabric 1 with the WRONG sides together. Pin in place and stitch around the perimeter about 5/8″ from the raw edge. 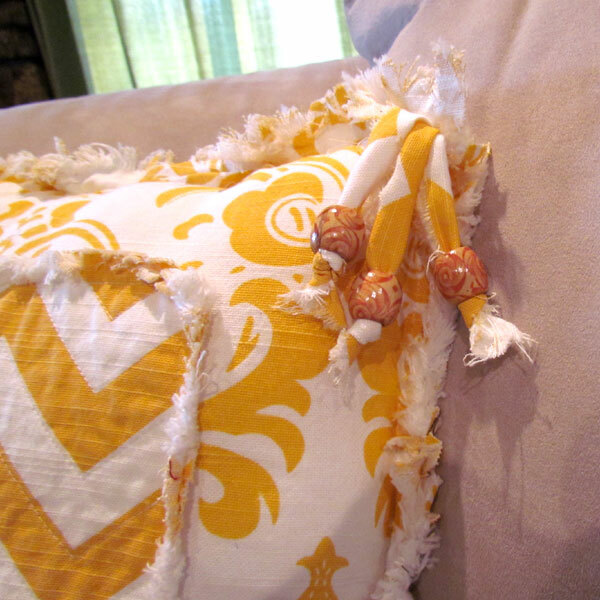 Leave about an 8″ gap unstitched so that you can stuff the pillow from there. Stitch around the perimeter again about 1/4″ inside the first stitch line. This will give your pillows a nice double stitching on the outer edge to keep that seam secured. 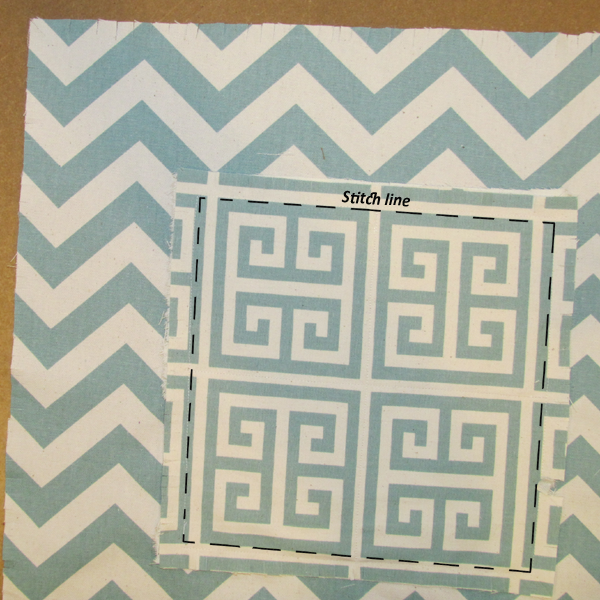 Now repeat steps 7 & 8 using the 17″ squares of Fabric 2 and the 9″ squares of Fabric 1. Wash both pillow covers in a washing machine using a liquid fabric softener to loosen the strings and create the “fray” on the shabby edges. Machine Dry. Use a lint brush to remove excess strings and press from the back side if needed. 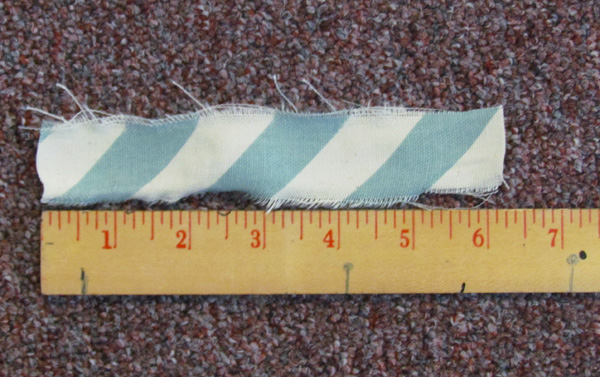 Using a seam ripper, open each corner about 1″ in each direction. Insert the untied end of three of the beaded strips into the corner. Pin in place. Restitch the corner now and be sure to stitch both seam lines. 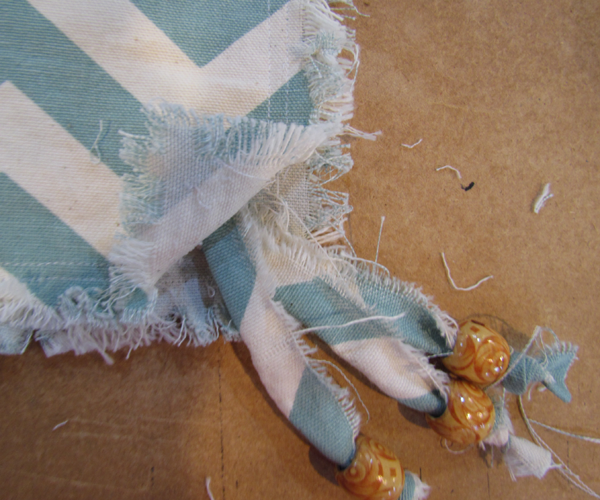 Take extra care to catch all the raw edges of the end of each strip into the stitching of the pillow. Stuff the pillow with polyfill. Using smaller handfuls of polyfill will result in a smoother pillow. Close the opening and pin in place. Stitch 5/8″ from the raw edges beginning and ending at the point of the existing stitching. Ta Daa!!! 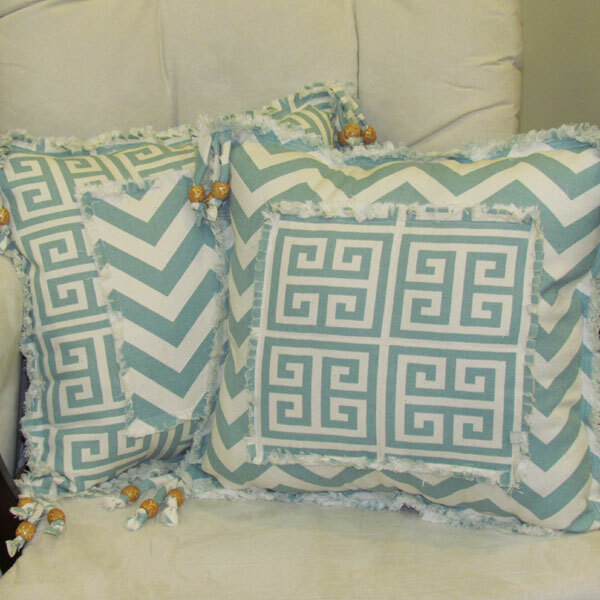 Your beautiful set of Addison Shabby Pillows are finished! Enjoy! The girls in the studio have put together some kits to make this Addison pillow which includes all the fabric you need and the beads. The polyfil and thread is not included but you can usually pick that up at any department store or craft store if you don’t have any on hand already. 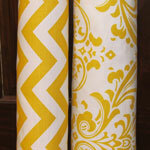 Pictured below are the fabric/color combinations available in the kits. 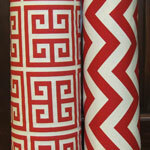 Do you have any great suggestions for projects with our Home Decor canvas fabrics? We’d love to hear about them! This Addison Shabby Pillow pattern can be easily adapted to use the primitive homespun fabrics sold at www.JubileeFabric.com. Because the homespun is lighter weight, you will need to double all your cut pieces so that each piece will be two layers thick. So when the pattern says to cut two pieces, with homespun adaptation you’ll actually cut four pieces since your pieces will each be two layers. 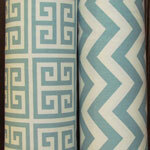 This means you will need more than twice as much material since the homespun is not as wide as the Home Decor canvas. We’ve added a revised Materials List below for the homespun adaptation. Because the homespun fabric will fray better, you’ll only need to make your clips about 1/2 inch apart instead of 1/4 inch that the pattern calls for. Please remember that regular printed cotton fabric will not fray well like you see in these pictures. Homespun fabric is recommended. 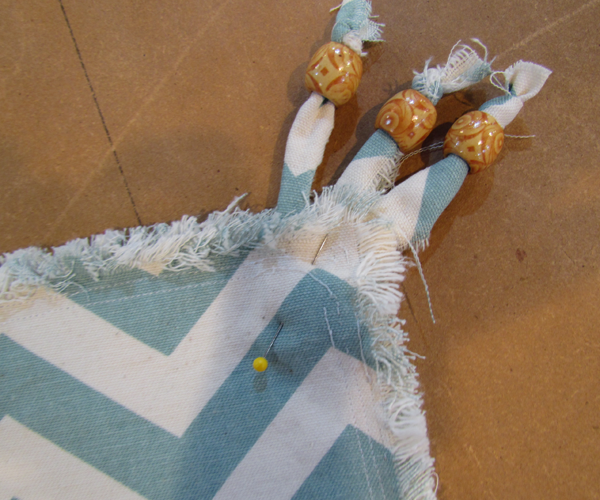 That is all you need to know to make this project with homespun fabric.